This photo released by Russia's Ural Federal University shows a small rock thought to be a meteorite from the Feb. 15, 2013, fireball that exploded over the Chelyabinsk region of Russia. NASA has estimated that the Russian meteor was 55 feet (17 meters) in diameter and weighed about 10,000 tons when it entered Earth’s atmosphere on Friday (Feb. 15). The meteor was travelling 40,000 mph (64,373 km/h) when it exploded in a flash brighter than the sun. While most of the meteor likely vaporized in the atmosphere, the rock was big enough that plenty of pieces likely fell to Earth, experts have said. Divers have been exploring the frigid waters, but have found no signs of meteorite fragments. Russian officials have said they think the hole was caused by something else and have shifted their focus to cleaning up from the shockwave damage, AFP has reported. The meteor was unrelated to an asteroid, 2012 DA14, that made an extremely close flyby of Earth on Friday, passing within 17,200 miles (27,000 kilometers), but never posing a threat to the planet. A Ural Federal University scientist works with a small fragment thought to be a meteorite from the Feb. 15, 2013, fireball over the Chelyabinsk region. Ural university scientists said that they had confirmed that the fragments they found were in fact meteorites (the term once a meteor has landed on the Earth’s surface). Tests they performed showed that they were chondrite, or stony, meteorites, the most common type of meteorite in the solar system, Reuters quoted one of the scientists as saying. The meteorite fragments were a mere 0.2 to 0.4 inches (0.5 to 1 centimeters) across, Reuters reported. Scientists aren't the only ones looking for meteorites from the Russian fireball. Collectors are also rushing to the region in hopes of finding chunks of the space rock. "This is the biggest event in our lifetime," rock dealer Michael Farmer of Tucson, Ariz., told OurAmazingPlanet, a sister site to SPACE.com, on Friday. "It's very exciting scientifically and for collecting, and luckily, it looks like there will be plenty of it." Farmer said he's planning to leave for Russia as soon as possible. "I wouldn't miss this for the world," he said. Purported pieces of the meteorite began appearing on eBay hours after the meteor blast, though experts said those were likely fakes. 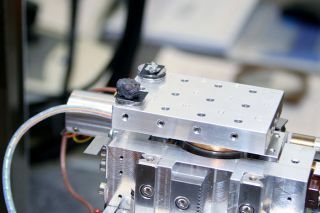 Just how much any actual chunks of the meteorite will fetch will depend on how rare the pieces are and the type and origin of the meteorite, Farmer said. Editor's note: If you snapped a photo of the meteor explosion over Russia that you'd like to share for our image gallery, send photos, comments and your name and location to managing editor Tariq Malik at spacephotos@space.com. Reach Andrea Thompson at athompson@techmedianetwork.com and follow her on Twitter@AndreaTOAP and on Pinterest.You can follow SPACE.com on Twitter @Spacedotcomand on Facebook & Google+.